A & T Motor Company are a family run business with over 25 years experience in the servicing, repair and MOT industry. The team pride themselves on the quality of their work and customer service, as well as offering competitive prices. The garage aims to establish great working relationships with all their customers, creating a level of trust that is so often lacking within the garage trade. Both domestic and commercial customers are welcomed, with a loyalty scheme and trade discounts also available. I have been a motor vehicle technician for 25 years and have built a very good reputation with customers, this has developed into a good customer base of which are very loyal and always recommending me to friends and family. All vehicle repairs & mot testing class 1 2 4 & 7 also vehicle body repairs and resprays. when im not working I love riding my motorbike and follow all the motorbike racing. I live in brownhills with my wife helen and our children. All repairs undertaken by A & T Motor Company have a 12 month warranty and do not affect the manufacturer’s warranty on your vehicle. 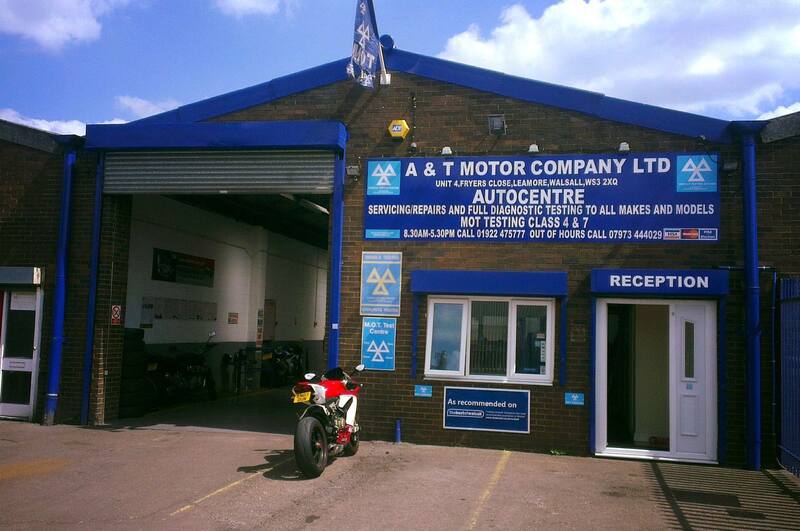 A & T Motor Company are a family run business with over 25 years experience in the servicing, repair and MOT industry. A & T Motor Company take great care in looking after our customers and making sure they are happy with the services we undertake.